The recent hot weather phenomenon has not only brought about a plethora of roof terrace “grill parties” but also seen almost everyone Zurich take to the water. The wonderful thing about Zurich, which seems to contrast with nearly every other inland European city, is that it has a high quality of water and this means that you are able to actually swim in its rivers and lakes. The result is a huge success and nowhere can this be more clearly seen than by the banks of the Limmat or more specifically at Oberer Letten (called the Letten by locals). For those of you unaware of the Limmat it is the river which flows into and out of Lake Zurich, part of this river is a shallow stony basin and another part transforms into a canal, originally for industrial purposes, but which seems to have a much higher popularity with the local bathers during the warm summer months. Located on the north bank of the river just 10 minutes north of the hauptbahnhof, Letten is an integral part of the summer social scene and on sunny days the river side is packed with people sunbathing rotisserie style inbetween frequent dips, as well as volleyball players, people barbecuing and lots of just general sitting down and hanging out. The laid back beach atmosphere will nearly have you believing that you’re at the Costa del sol but without the annoying sand. 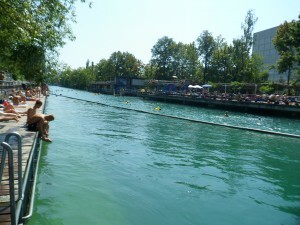 The best thing about the Limmat though is that local businesses have managed to develop along the banks of the river and beer, drinks and food are available for not an overly unreasonable cost (by Zurich standards), as well as some deck chairs, tables, grassy areas and even for the brave, bridges for some high adrenaline jumping. The bridges as yet remain a personal goal left unchecked for me. If you don’t feel like paying out for food at the bars however you can always bring your own or nip over the more northern bridge to the conveniently placed Migros supermarket. Here you can pick up some food from the deli, or snacks and drinks from the very large supermarket located underneath. Sun cream is also an important factor (factor 30) for those of you considering a longer afternoon by the Limmat and while the sun here is not as strong as in the south of Spain for example it still has a good effect, especially on those of us not used to being frequently exposed to anything more than rain. So with the good weather set to continue into the weekend, get your swim suit out, jump in and enjoy. Summer’s Here, Bring On The Water! After a weather of “beschissenem Wetter” the sun and subsequently the “Gluthitze” has returned to Zurich. For many coming from North America this heat is nothing unusual, but it is hard to cope with given the fact that most places lack air conditioning, and those places that have it never turn it up as high as say a North American cinema. As hot as it may be, summer is when Zürich really shines and shows that it is truly one of the best cities in the world. Contributing to the high standard of living is the number of public swimming pools and “baths”. Zürich has more places to swim than almost any other European city, which is fascinating given the fact that it is still landlocked. These swimming pools (“Badi” in Swiss German) are mere minutes from every district in the city. There are 6 pools, 6 beaches/bathhouses on the lake, and 5 bathhouses on the Limmat, numerous areas to just swim at your own risk and 7 indoor swimming pools. That adds up to 24 public pools, beaches and baths that are also supplemented by 8 school swimming pools that open to the public at certain times. The baths are so well organized that men not wishing to be harassed by women’s goggling eyes can swim at the Flussbad Schanzengraben (for men only). Women also have a private bath at Stadthausquai. And if you live on the Gold Coast in places such as Herrliberg, you may have a beach for town residents only. Here you’ll have to put up with both men and women, but at least you can be socially exclusive. Unlike many North American cities with lakes and rivers that post water quality hazards and closures of public swimming areas on a regular bases, Lake Zurich (Zürichsee) is renowned for its water quality, which is in fact so clean that many of the fish are dying as there is nothing for them to eat. This fact is welcomed by many swimmers as it ensures a degree of relief as they do not need to fear a Jaws-like fish devouring them while peacefully swimming at one of the lakeside baths. One of my favourite baths is the Utoquai. Swimming here is like taking a trip back to 19th century Zurich. It was designed by William Henri Martin and built in 1890 as a bathing palace to accent the newly built quay along the lake. The original structure had four separate areas for men, women, boys, and girls. The sunbathing terrace on the roofs were added in 1908. In the 1950s the bath house was almost demolished during a craze of rebuilding and redesigning the city. However, the people of Zurich then as now cherished their baths and would not allow this. In 1973 the boys and girls swimming pools were covered and turned into sunbathing areas. In the 1990s a sauna and massage area was added, making the bath usable year round. If swimming isn’t your thing, but you’re still looking for a way to cool down try on of Zurich’s 1200+ water fountains with drinking quality water. Not only an excellent way to cool down, but save money and the environment. Speeding In Switzerland. They Will Get You And You Will Pay!